This can be your family doctor, your internal medicine physician, your neurologist, or any physician who feels you may have a movement disorder. (Download the Neurology Department Referral Form here and download the Center brochure here) or fax your demographic information. They can obtain a referral form by calling our scheduling department at 352-294-5400. The schedulers can respond to any questions you may have about the Center for Movement Disorders and Neurorestoration. If you don’t hear from us within 10-15 business days, please contact your referring physician’s office to be sure they sent us the requested information. Once this has been verified, then call 352-294-5400 to ask about your appointment. Below is a video you can watch and a form you can fill out that will make your first visit much smoother. You will be ready to see the doctor about 10 minutes sooner if you watch it before coming to your appointment. Download the PDF form below (by right-clicking on the link and choosing “Save As”), print it out, then fill it out to the best of your ability. It is quite lengthy so if you are unable to fill out portions of it before your visit, that is OK. Bring it with you to your appointment and we will help you fill out the portions you were unable to complete. Please review the following list of medications. If you are taking any of these medications, please stop these medications at least 12 hours prior to your first appointment. Carbidopa/Levodopa, Sinemet, Stalevo, Parcopa, Azilect, Atamet, Mirapex, Amantadine, Requip, Parlodel, Comtan, Stalevo, Apokyn, Zelapar, Selegiline, Eldepryl, Tasmar – these medications should be stopped 12 hours prior to your visit. Sinemet CR, Sinemet ER and Requip XL – these medications should be stopped 24 hours prior to your visit since they are the longer-lasting versions. If you are not taking any of the medications listed, please continue to take your medications as directed by your local physician. You should take all other medications and eat a normal breakfast or lunch before your visit. Please ensure you bring your completed questionnaire with you to your appointment. This will streamline your first visit and allow the physician more time to discuss your medical history and evaluate your movement disorder. Please bring ALL of your current medications with you to your visit, in the appropriate bottle as given to you by your pharmacy. Past medications you have taken and why you stopped them. Past surgical procedures relevant to your movement disorder. Any family medical history that may be relevant to your movement disorder. As always, our staff is available to answer any questions you may have concerning your new patient evaluation. Also, we are happy to try and assist with some special arrangements if you will be in need of assistance during your visit. Please call (352) 294-5000 to reach a member of our scheduling team.We look forward to seeing you in clinic! Below is a Google map to our location. You can use the “directions” function to get directions from your home to the Center. 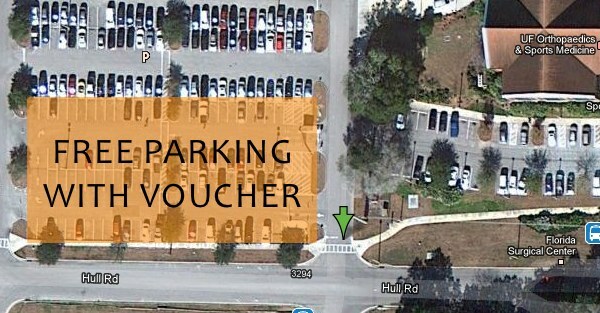 Parking is available in the section highlighted in the map below for free with a voucher after your appointment. Turn right just past the building then immediately turn left into the gated area. There is also valet parking available at the front entrance of the building. Valet parking is free but they do accept tips.